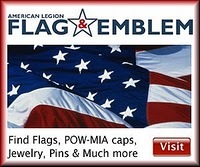 The American Legion is a patriotic, mutual-help, wartime veterans organization. We have REGULAR LOCAL MEETINGS in Hominy, Oklahoma. on the first and third Thursday of every month. The Koffee Klatch is held every Monday morning between 7:00 am – 9:00 am. Note: Breakfast is not held during inclement weather and Monday holidays. Auxiliary Unit 142 meets on the second Monday of each month, at 6:00 p.m.
Visit our local Event Calendar for upcoming activities and meetings.